Call today to book your visit! 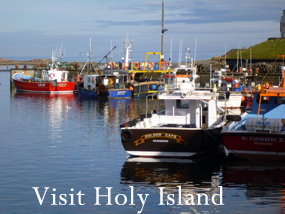 Enquire here to book your stay! Fantastic relaxing weekend in a beautifully appointed B&B close to unspoilt beaches and some great walks on the door step! Melanie & Rob went that extra mile to make the weekend really special…thanks again, we will definitely be back soon! Old Stone is a recently converted stone building set in a peaceful location on a small exclusive development. 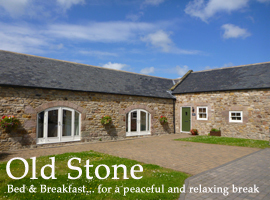 Nestled between fields & close to the Northumbrian Heritage Coastline with beautiful views across to Bamburgh, Holy Island and the magnificent coastline, Old Stone is owned and run by Melanie and Rob who have added many personal touches to their home to ensure you have a peaceful and relaxing break. Their generous breakfast menu uses locally sourced food wherever possible such as free range eggs, award winning sausages from Rothbury Family Butchers and Craster Kippers served with freshly brewed tea and coffee, fresh orange juice & toast. Old Stone is ideally situated for easy access to local attractions. The historic town of Alnwick is just 9 miles away with its cobbled streets, weekly market, Playhouse Theatre, the majestic Medieval Castle used in Harry Potter and water feature gardens offering a unique dining experience at The Tree House. A short drive takes you to the picturesque village of Bamburgh with its spectacular castle and amazing stretch of golden sandy beach. We are also ideally situated for anyone attending weddings or functions at Doxford Hall or Ellingham Hall, as Old Stone is less than 4 miles from both of these popular venues. Currently the only way to book or request room availability is by contacting us directly – use the enquiry form on this page or please call us! Melanie or Rob on 01665 589584, 07846494639 or 07742769312.